This 41 Luhrs for sale by Kusler Yachts San Diego yacht brokers is an exceptional deal! Rigged and ready to go ! 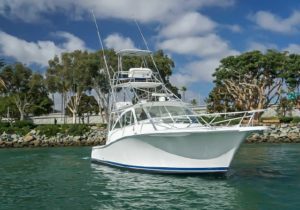 !..Ultra dependable low time ( 650 hrs) CUMMINS QSM11’s..super clean with all services current this original owner vessel will exceed expectations..Contact Kusler Yachts sportfishing experts today at 866-607-5471!